LandLAB have developed the landscape and public realm for Precinct Properties Commercial Bay project. 'Sky Terrace' introduces a sculptural, green landscape experience overlooking the Waitemata Harbour. Concieved as a ‘geological’ terrace informed by the interaction of coastal edge ecologies (fluid) and the city morphology (grid) the project has embraced a generative design strategy to inform shape, topography and arrangement. LandLAB have collaborated with Tauranga City Council and Warren Mahoney Architects to develop a concept design for Tauranga's new Civic Campus. This project will deliver transformational change to the city centre through the aggregation of civic functions around a new terraced, green public open space armature that reconnects 'city' and 'sea'. LandLAB have been included in Phaidon's recently published 30:30 Contemporary Landscape Architecture. The book includes "30 of today's most forward-thinking landscape architects and 30 of the world's most celebrated landscape architects." Included are features on the Karanga Plaza, Daldy Street Linear Park and Wynyard Commons projects. We're in pretty good company as the book also include profiles on LandLAB favourites such as Aspect Studios, Topotek 1, Field Operations, and StossLU. Madden and Pakenham Street site works in progress. The first phase of the Avon River Park in Christchurch is nearing completion including the new river terraces, a shared space promenade and refurbishment of the Bridge of Remembrance. We've just completed documentation for Lombard Lane and the Bond Street shared space in Wellington's city centre. A project which defines a new look and feel and kit of parts for Wellington's future urban laneway network. LandLAB are excited to be working with Auckland Transport, Auckland Council and the Karangahape Road community to guide the development of a public realm plan for this iconic, urban street and creative community. 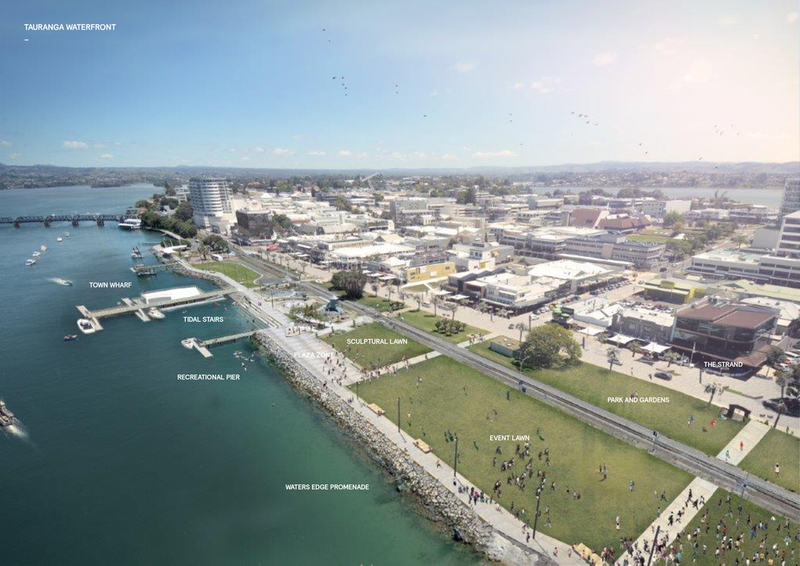 LandLAB are working with Tauranga City Council to develop a new concept plan to guide the development of the city centre's waterfront precinct. The first phase of the project includes the implementation of a new Town Wharf, promenade, tidal stairs and recreational pier. The first phase of the Avon River Park project is currently under construction in Christchurch. This first section of work includes the creation of a new river edge Terraces (centre) the first section of the River Promenade (left) shared space and the refurbishment of the landmark Bridge of Remembrance (background). LandLAB_ are working with Aecom and JASMAX to develop the public realm and associated program of strategic activation initiatives which will provide the catalyst for the transformation and re-generation of the 'South Frame Precinct' in Christchurch. The $20m project introduces a new east-west walking and cycling 'greenway' and a network of 'lanes' and 'yards' which reflect the sites former fine grain, city fringe morphology and industrial heritage. LandLAB are working with FearonHay and Panuku Development Auckland on the transformation of the Westhaven Platform 2 project. This delivers a new working, marine village - to serve the operation of the Marina - integrated with the recently completed Westhaven Promenade project. Marine Plaza located on alignment with the marina fairway and views to Silo Park and Quay Street beyond will be the focal point of this village. LandLAB_ are working with BECA and Tauranga City Council to develop a Spatial Framework for Tauranga city centre and waterfront which will identify a vision, co-ordinate public and private investment and guide the long term development of the city centre into a vibrant, diverse and successful focus for the Bay of Plenty region. The first phase of the Long Bay's 20ha Vaughans Stream Reserve is underway. The first of of 3 wetlands which treat run-off from adjacent Village Centre has been formed and the wiers and the Vaughans Stream Bridge is currently under construction. First of the forebay wiers being installed. LandLAB_ have been working with Panuku Development Auckland and BECA to pilot the use of the Infrastructure Sustainability Council of Australia (ISCA) 'sustainable infrastructure' ratings tool for the $20m Madden & Pakenham Street project. The trial has fine tuned the tool for use in the New Zealand context to enable a rating system for the planning, procurement, delivery and operation of future infrastructure and public realm projects. Madden and Pakenham has been used as a working case study to explore the design, delivery, technical performance and resiliance of urban landscapes and infrastructure. We are thrilled that the project has been awarded 'excellence' - the highest possible rating. LandLAB_ are ISCA accreditted 'green infrastructure' professionals.